As mentioned in the "zucchini-lemon" cookies post, Benjamin is more than happy to eat things, providing you don't tell him exactly what is actually in them. 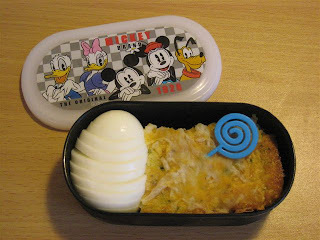 Today's bento lunch snack is no exception. My mom makes what she calls "zucchini appetizers" with fresh zucchini grown from her garden. They are similar in composition to a cornbread, but with no corn. Instead, they are flattish bread with zucchini, parmesan and spices. When we were home in Canada during the summer, she made them for a dinner and Ben liked them. Of course, we did tell him they were "CHEESY appetizers" and didn't really elaborate on the zucchini part. He also accepted that the "green stuff" was seasonings. Today for snack at school, Ben has a sliced boiled egg and a piece of yummy "cheesy appetizer". Combine all ingredients and spread into greased pan. Bake for 50 minutes at 350 or until baked through and lightly golden. When about 5 minutes from done, top with shredded cheese and bake for a couple more minutes to melt. Slice into squares while still warm. **My note - Besides slicing the zucchini, you can shred it in a food processor. Ben has more trouble identifying it that way and I actually prefer it shredded too. Sound tasty. I still have zucchini in the garden, so I can give this a try. I (we) are just back into packing lunches after a hiatus and I am really enjoying the ideas here. Thanks for sharing! The zucchini "cheesy" bread sounds great! I just made apple bread (we have 3 apple trees!) so will finish that off before trying this though. I think I used an 8x8 square one? I also have a smaller (maybe 7 or 8 x 11 or so) rectangular one, so it might have been that. This looks yummy! But we don't do bisquick, any thoughts on what I could replace it with? This is the equivalent of one cup of Bisquick. It has to be stored in the fridge, though. Shannon--These are TDF!! Love them. I made them in cupcake tins and they worked great. No need to cut them. @ Michelle: I googled a homemade Bisquick and they turned out great.